Haywoods Heath - an important college needs to get its message across with a well designed PowerPoint presentation. Outline: Haywoods Heath 6th Form college in the heart of Sussex want to raise the stakes. Brief: The college already had a presentation which was given to potential students every year. The presentation was produced by a class teacher and it was revamped every year. It was felt by the college that the standard of design was not up to that expected by discerning 15 year olds. Approach: Working with the college marketing team and Principal the key point that needed to be made were identified in the current presentation. As much as possible was removed and new slides designed to help the speaker emphasise the points that had been missed. Result: A strong swell of interest was felt at the college the new image not only attracted new students but made the staff feel even better about the college. 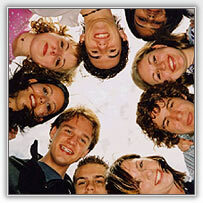 The college is also positioned as a user of modern effective well designed media. We provide the whole process, from original concept, creation of content, packaging design and pressing. Fresh Created an Interactive CD ROM to boost the university's marketing cost effectively oversees.